The modern city is a space of movement, flux and flow. Everything changes; sometimes instantly before our eyes, and sometimes almost imperceptibly over time. 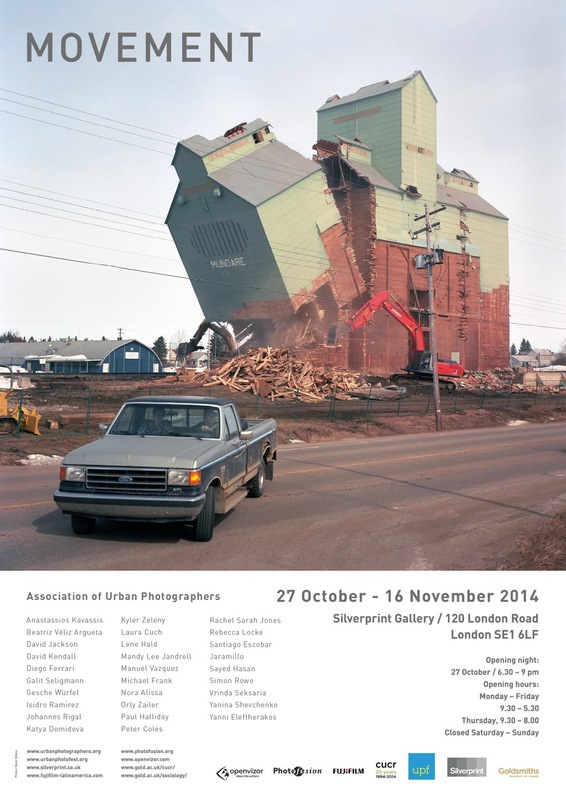 This year Urban Photographers present Movement, their inaugural exhibition. Association members were invited to respond to the exhibition theme, and there was an expectation that the resulting images would be varied, conceptually diverse, and have a quality of montage rather than a tight, linear flow. The Association of Urban Photographers is an international group of 30 photographers and artists, all with a shared interest in urban spaces and places. Their work – whether it is about making, publishing or exhibiting photography – asks fundamental questions about the nature of contemporary urban life. Their central concern is to open up discussions about how image-makers and urban researchers can rethink ways of engaging with and encountering the city. The exhibition is at The Silver Print Gallery, 120 London Rd SE 6LF. (closest tube, Elephant and Castle) until the 16th of November 2014. Opening times: Monday-Friday 9.30- 5.30, Thursday 9.30-8.00, Saturday and Sunday closed. Movement is part of Urban Photo Fest and has been supported by Goldsmiths, University of London, Tate Britain, Photofusion, Openvizor, Silverprint gallery and iUPSS.